Eggs for one is easy. You poach, scramble, fry, hard boil, soft boil, or make an omelet. Whatever suits you. Eggs for two is the same. Even eggs for four, although the poaching might get a little tricky and you might feel like a buffet cook at a bad hotel with the omelets. Eggs for eight really necessitates a frittata, a Mediterranean style one or a frittata made with grits, or perhaps onions that have been cooked long and slow. But more than eight people means you need to start thinking egg casserole. We attended a New Year’s Day brunch with a group of my favorite people. Five couples with kids, all of whom had celebrated New Year’s Even in some way or another. In other words, we needed plenty of eggs and the cheesy grits that our hosts make and make so very well. I have made a savory bread pudding for this gathering before but with the grits and biscuits and muffins, I thought something without bread added it to it would be a better option. Epicurious had plenty egg casseroles but most of them had giant huge tremendous amounts of cheese. One notable recipe had 8 cups, that is two pounds, of cheese for four eggs. I’m sorry. That is a cheese casserole, not an egg casserole. The one I eventually decided on is not exactly spa food but there are some vegetables and herbs and much of the cheese is actually cottage cheese. Because we were a large group, I tripled this recipe and split it between two large dishes. 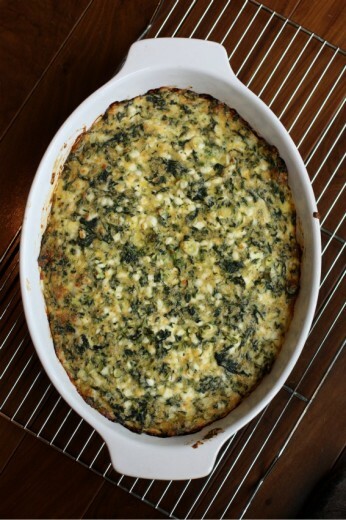 As it baked and I could smell the mingling of the scallions, cheese, and dill, I realized that I had made a very good choice and the taste proved me right. We ate a full one and a half which was a lot of egg casserole. I even sacrificed some of the stomach room I had reserved for cheesy grits and filled it with egg casserole. The next time you are making eggs for a group, this is a surefire hit, but you can also enjoy it on a much smaller scale by making the recipe as written and not tripling it. One more note. I know some of you are new here so I thought I would put this out there. I cook a lot of food and a large percentage of that food never sees this blog. Sometimes it is because I just can’t get a decent photo (there is a gorgeous Beet Tart that I made four times in a month and just can’t seem to get my photography ducks in a row). Sometimes it is because the food is not blog worthy. In other words, I don’t put up every single thing I cook – only the things that I really like or think you would really like. Occasionally, I will talk about something that didn’t work but I really do that to air out my frustration or to demonstrate that, although I have been cooking for almost 20 years and have made somewhat of a career out of it, I can make mistakes just as easily as a newbie. All this to say, I’m not just telling you about egg casserole because it was something I made. It’s good. Preheat oven to 350°F. Butter 8x8x2-inch glass baking dish. Beat eggs, salt and pepper to blend in large bowl. Mix in spinach. Add remaining ingredients and stir until well blended. Transfer mixture to prepared dish. Bake casserole until center is firm and top is golden, about 45 minutes. Give the dish a shake, the center should not wobble. Allow to cool 10 minutes, then serve. This dish can sit and be served at room temperature. Not all of my recipes are blogworthy or my photos either, but part of the fun is in experimentation. It is a good feeling when it works. Love how simple and comforting this looks. That is an insane amount of cheese from the original casserole! Cottage cheese in baked egg dishes is SO good! It adds so much texture and creaminess, without TOO many extra calories. Oh, and it adds even EXTRA protein, double whammy! The cottage cheese is a great idea! The spinach strata I made for Christmas morning looks similar, but had eight slices of bread, half-n-half and 1 1/2 cups of gruyere. This one looks a lot healthier. This looks yummy and good for you. I love cottage cheese in egg dishes and dill! I might try pepper jack cheese. I can see it paired with a salad for dinner! Hummm Beet tart you say. That sounds wonderful too! Do we really need a great photo more than a great recipe? I’m SO glad the casserole turned out! I was hoping you would share the recipe if it did, rather than just tempt me with it over twitter. :P I do, however, still think this needs a side of cheesy grits. For posterity’s sake. I made this for my dad’s birthday brunch today. Served it with minestrone. It was a delicious! The dill really adds something special. It was a nice light option following my holiday gorge-fest.! Thanks, Dana! I made this in individual ramekins and brought it to work for lunch…delicious! I actually skipped the cheddar to make it a tad lighter for lunch and it still had great flavor and richness from the cottage cheese. I’ll definitely be making it again. Thanks Dana! I know I’m going to love this dish! Looks delicious – now I just need to get some cottage cheese! Dinner tonight I think as it’s been ages since I’ve had eggs (and now I’m craving them). 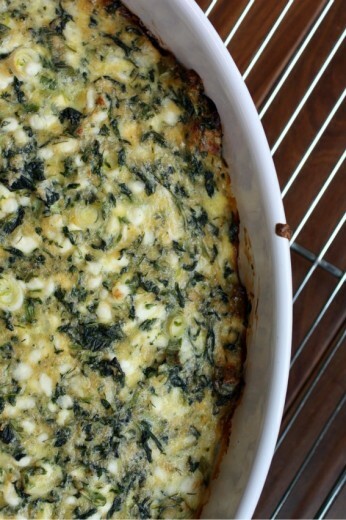 I love egg casseroles… This looks perfect for dinner one night next week! Love your recipes, commentary & style…thanks for the inspiration! Yumm this looks good and I love that it’s an egg casserole but doesn’t have 8 or 12 eggs as some others I’ve seen. I’m so excited to try this as a dinner option. 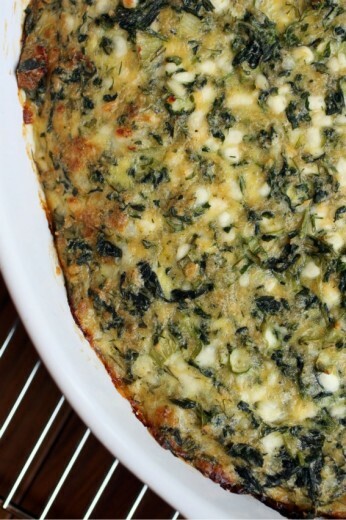 I love spinach with eggs and adding cottage cheese is a favorite, too! How can this not be a winner? Problems w/ the center. You can use reduced fat cheddar if you need to. (From a jar) for color, additional flavor. I’m totally enticed, Dana! My mom makes a casserole with cottage cheese, it works so well. Dana, I just wanted to chime in to say that this has become a go-to brunch favorite. Even if it’s got a little extra cheese, it’s a great way to counter all the baked goods that often show up at brunch, and the kids love it. Leftovers are also great for lunches. Thanks for sharing this many moons ago!